Enhance your tour of the Cotswolds with a leisure cruise on one of the Cotswolds rivers including the Avon, Severn and Thames. See below a list of local companies offering River Cruising and Trips. Luxury hotel boat operator, English Holiday Cruises, recently launched next year’s programme of cruises along the River Severn and Gloucester to Sharpness Canal, visiting a wide range of world-class tourist and heritage attractions en-route and proving that you don’t have travel to the Rhine or the Danube to experience an authentic river cruise holiday. Passengers can select cruises from between two and six nights on board the ‘Edward Elgar’, a 22-berth, four-star, continental-style hotel boat that journeys on Britain’s biggest river, the river Severn, between Sharpness in Gloucestershire and Stourport in Worcestershire, from April through to October. The Edward Elgar has recently been completely refurbished and re-equipped and she is now a very luxurious river cruiser with comfortable beds and en-suite shower rooms in all cabins. Traditional English meals are prepared on board by a resident chef and served in a spacious, climate-controlled saloon with wines, beers and soft drinks provided free of charge at lunch and dinner. Our most popular cruise takes in the whole of the Severn navigation and features a round trip with more than 100 miles of cruising - at just 4mph! Since 2001 this cruise has taken thousands of people to see the River Severn between Gloucester and Stourport. For those that want to see the delights of the River Severn as far as Worcester but also want to take in the amazing views on the G&S ship canal. A weekend on the first ship canal ever built. Join us Friday evening and have a weekend of cruising with stops at Slimbridge WWT and a traditional Sunday roast before you go home. Three nights on the worlds first ship canal. Discover Berkeley castle as well as the Purton barge graveyard and Slimbridge Wetland Centre. 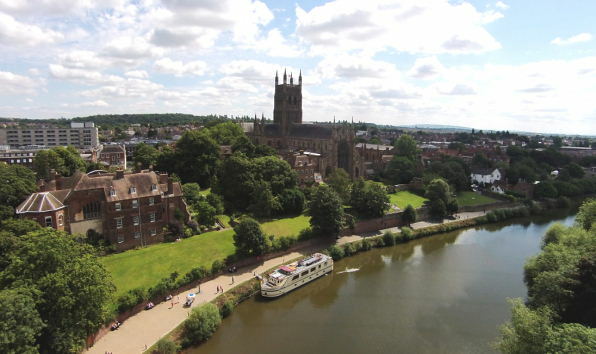 A four night cruise on the River Severn that stops in Gloucester, Tewkesbury, Upton and Worcester. 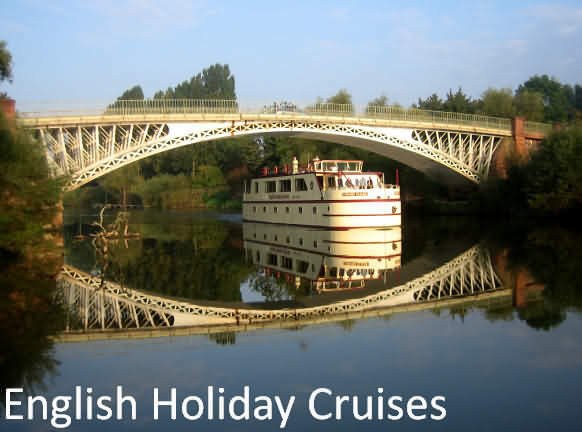 Please visit English Holiday Cruises website for comprehensive further information, availability and prices. Enjoy a cruise aboard one of the traditional Edwardian passenger launches from Stratford-upon-Avon. Cruise downstream past the Royal Shakespeare Theatre and Holy Trinity Church (the site of Shakespeare's tomb) before turning around and passing under the 15th Century Clopton Bridge. Once through the bridge, the scenery changes as you are carried upstream to discover quiet river-banks and meadows with glimpses of large secluded houses and beautiful river-side gardens. Experience the fascination of Gloucester waterways at first hand on a 45-minute long trips along the Gloucester & Sharpness Canal. Boat trips depart from the National Waterways Museum (at Gloucester Docks) between April and October, accompanied by expert commentary on the history of the canal. Times and availabilty vary with up to three sailings a day during peak periods. Please check with the museum by telephoning 01452 318200 before planning your trip. Combined boat trip and museum entry tickets are also available. River trips from Evesham are available from the end of March through to mid October and operate from the beautiful and award-winning Abbey Park in the centre of Evesham, with excellent facilities, shops, museums and car parking close by. The 55 seater passenger boat – The Handsam Too – is simply the best way to enjoy the River Avon. Twenty five minute trip taking in Evesham Lock and Hampton Church. 11.00 to 16.30 on the hour and half hour. Trips are available from Lechlade (subject to weather and river conditions) aboard the Thames launch Inglesham throughout the summer season (9th April to the end of September for 2011). The departure point is on the south bank of the river from the popular Riverside Park (by kind permission of The Cotswold Water Park Society). You will be taken on a relaxing and informative cruise every weekend and Bank Holidays during the season and often operate on weekdays as well during the spring & summer school holidays. Normal operating times are from 11:00 until 17:00. Car Parking is available at the Riverside Park. Take in a fascinating stretch of the River Thames from Oxford and cruise down the university regatta course towards quaint Iffley village. You will pass the ancient Folly Bridge, Christchurch College and Meadows and the university rowing houses. This is one of the busiest and most colourful stretches of the Thames (the stretch locally known as The Isis). Rowing eights, punts, university boats and large pleasure cruisers come together in a lively display of all that the river has to offer. For an experience to remember go aboard the “Silver Salmon” for your Bath river cruise on the river Avon. Enjoy a luxury river cruise and see the beauty of the historical city of Bath and the relaxing scenery of the countryside and wildlife down river. The river vessel is fully equipped for safety and comfort and the moorings are very conveniently situated close to Avon Street car park, the Riverside coach park and Bath Spa station. Every booking is tailored for your personal requirements and Bath cruises can be arranged for any duration. Typically, a Bath river cruise of up to 2 hours takes in the sights of the city where we sail right into the weir at Pulteney bridge and see a variety of wildlife on the outskirts of the city. 3 hours takes us downriver through the lock at Weston island, as far as Newbridge and back, and 4 hours allows us time to go further downriver towards Saltford.